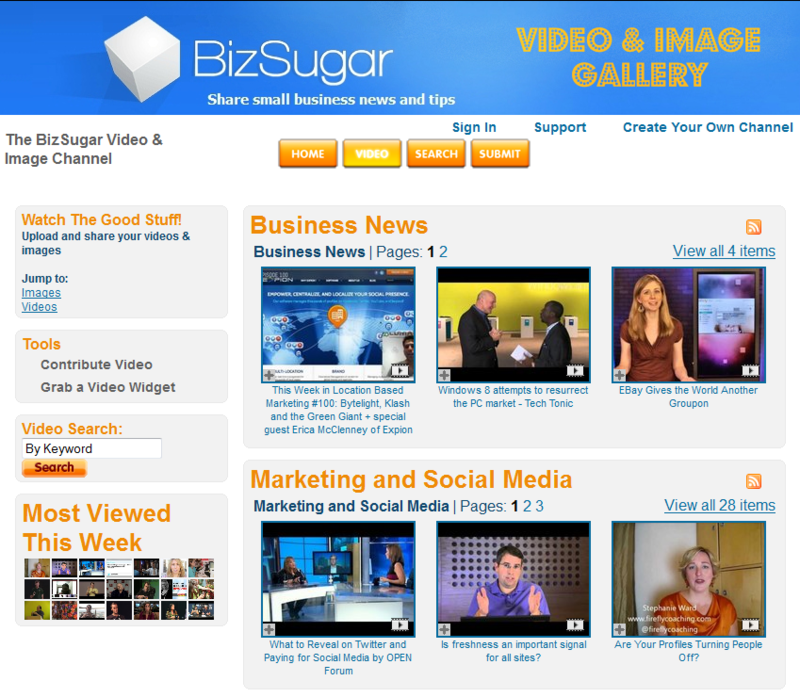 BizSugar Blog » BizSugar’s New Video & Image Gallery Open for Small Business! BizSugar’s New Video & Image Gallery Open for Small Business! Just go to our new “Sweets” tab on BizSugar, and you’ll see a drop-down menu with “Videos” and “Images” links. You can get to the gallery either way, so just click on through. We’ve even got a “Fun in Business” section where you can view or upload everything from quirky business memes and amusing anecdotes to animated shorts and edgy, funny videos on business topics. And don’t forget the “Image” part of the gallery! Just click on the “images” link on the left sidebar, under “Watch the Good Stuff!” That will take you to our still images section where you can see “A Brief History of BizSugar in Pictures”, view member submitted pics, or upload your own small business images. And uploading a video or image is simple! Just click “Sign In” and register for a free account. We strongly recommend using the same handle you have over on BizSugar, so that your devoted friends and followers will recognize your submissions instantly. Once you register, there’s no waiting. You can go right to your profile and start beefing it up, or you can upload your first video or image right then and there. Just click on the friendly, orange “Submit” button along the top of the page. You can submit videos and images from popular sharing sites like YouTube and Flickr by pasting in the embed code, web link or feed address, or you can upload content directly from your computer, camera, or smartphone. You can even search for your favorite small business videos right from the gallery! So what are you waiting for? Don’t keep those awesome small business photos and videos to yourself. Upload them to the BizSugar Video & Image Gallery today! Great new feature! I have uploaded Randy Pausch’s lecture on Time Management. Very cool! Or should I say sweet?! Great feature! Thanks for offering this to the Bizsugar community. Nice! Looks like I need to film someone reading my blog posts!